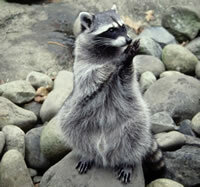 Raccoons – Raccoons are ubiquitous in forest areas, but it is not uncommon to see one in an urban setting. They are omnivores, which means that they can eat both plants and animals. Therefore, they adapt easily and inhabit lots of different areas. The raccoon population is expanding, according to scientists. They are moving into city areas in greater numbers. (I actually found one digging through the trash cans outside of my apartment recently) They tend to shy away from humans, but you don't want to approach one as it may feel threatened and try to defend itself. Bald Eagles – Once considered an endangered species, the bald eagle now flourishes throughout parts of North America. The bald eagle is a large raptor with beautiful brown feathers on its body and bright white feathers on the top of its head. It is a fierce and graceful predator. You can see why it appears on the seal of the United States. It is the United States' national bird. It mostly lives in parts of Canada and the Northern parts of the United States, though it may migrate more south in the winter. American Black Bears – Native to North America, the American black bear is smaller than a brown bear but can weigh over 500 pounds (225 kg), so it is still pretty big. You may encounter black bears if you are hiking or camping in the U.S., but they are also known to enter suburban areas in search of food. No matter where you may see a black bear, you'd be wise not to stay away from it! Its diet consists of mostly vegetables, insects and fish, salmon in particular. Unlike some other bear species, the black bear is fortunately not considered endangered. It is believed that their numbers range in the millions. American Alligators – Native to the American Southeast, alligators can be found in the states bordering the Gulf of Mexico and the coastal parts of North Carolina, South Carolina and Georgia. Alligators live in wetlands and will eat mostly anything they can fit in their mouths. They are less aggressive toward humans than crocodiles but you still wouldn't want to try to pet one if you saw it. Coyotes – They are most associated with the American deserts, but Coyotes are easily adaptable and able to live in all kinds of environments. In fact, Coyotes now inhabit a lot of urban areas. The coyote [and wolf] howling at the moon is a familiar element in American fiction. Other animals like the moose, the gray wolf, and the rattlesnake are associated with North America but can also be found in some numbers other continents.